ETF is a well-known instrument in the exchange market to help to get a big return. This is the way to invest in the exchange market like the mutual fund. Very good returns can book by conscious step. This is a scheme of Mutual Fund. It provides unit on your payment. Working of ETF is similar to MF. Mutual fund company, purchase shares of the number of companies by collected amount and ETF provides similar service. So, an investor gets the benefit of the number of company shares by purchase 1 unit of shares. These processes reduce the risk of investment. Sell and purchase process of ETF is similarly like share market. The investor can hold a demat account for a successful transaction. Every year ETF book big profit and given the good return to the investor. In 2017, ETF has given 43.6 percent return in a year and this benefit come from CPSE ETF category. ETF booked 8.2 percentage minimum return in 3 years and 24.2 percent maximum. ETF return is double from saving account and 1 percent more from fix deposit rate of interest. Banking ETF scheme also booked a 20 to 37 percent profit in 2017. Another benefit you will get in ETF that expanse ratio varies from 0.25 to 0.50 and less from the Mutual Fund (2 %). These figures attract you to start investment through the ETF scheme. You can sell your share any time on a working day. It is more convenient to sell from the Mutual Fund. Less expanse ratio provides more benefit to the investor. You will get unit of the number of companies to purchase one share through ETF. If you require your money then withdraw, otherwise invest Systematically for the long term. That will help to reduce risk and you will definitely book a good profit. ETF value depends on Sensex ups and down. Every mutual fund company issue ETF on NSE and BSE Sensex. The ETF growth depends on the growth of several sectors like banking, gold, government undertaking organization. It is difficult for common people to choose the good shares from the NSE, BSE, and Banking sector. But investor will get the benefit of all banking share to purchase 1 unit through ETF. I would like to say here that if you purchase 1 unit of banking share from ETF if 10 banking shares involve in 1 unit and 5 of them loose and 5 booked profit, you will never lose money. Profit will come on average calculation. If you invested directly in the share market, can lose your money completely. This risk balance by mutual fund and ETF scheme. CPSE ETF first issued in 2014. 2nd installment issued on 17 January. The investor has booked a 7 percent return for the last 3 years (2017). In 2014, return was 28.6 % and 16.4 % in 2016. Only it was down slightly in 2015 (14.4 %). The average return was 7 %. You can start your investment with a minimum amount of Rs. 5000/-. 10 public sector shares also included in CPSE ETF. That makes more attraction among investor. PSU involves are - ONGC, Coal India, IOC, Gail India, Oil India, Bharat Electronics, REC Engineers India and Container Corporation Of India. Gold ETF is started for those investors, who love gold and earn money from investment in Gold. 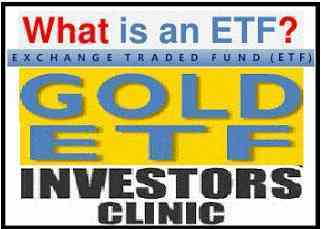 Gold ETF has adopted the same working strategy as Mutual Fund. You will get a unit of your invested amount. That unit value depends on the value of the present stock market. Gold ETF is not provided good returns from the last three years. The return was 20 % in the last 2 years. You can purchase and sell the unit like share. Government is given the opportunity to purchase document. If you purchase Gold Bond as an investor. You can get a 2.5 % yearly interest on 1 gram price of gold. These points are discussed here to aware about the profitable tools of investment. Today bank interest rate will not beat inflation, you will be searched other option to meet out your future target, So Mutual Fund and ETF provide the platform for systematic investment. Don't invest your money in single MF. Go with the number of Mutual Fund company. For example - I want to invest 10000/- Rupees, select ten Mutual Fund Equity scheme, analyze last 3 to the 4-year performance of the fund and invest 1000/- Rs. through SIP in ten MF company. This monthly investment always keeps you in profit. Set long-term horizon for investment and book benefit of low purchase rate. Above give 6 reason helps to guide investor for share market through ETF for the big return.